There are many ways to find a dog trainer. You can ask your vet for recommendations. Neighbors and friends may have used a trainer in the past and will recommend him or her. You can ask your Facebook network. Or you can do a Google search. You can also search leading industry group websites for dog trainers. All of these sources will yield dog trainer or dog training company names. 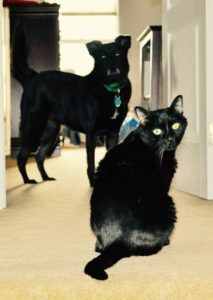 We recommend you first do these two dog training industry websites: www.APDT.com and www.petprofessionalguild.com. When searching on APDT.com, we recommend you limit your search to certified trainers. This ensures that you hire someone who has taken the extra step of obtaining a certification. This shows their understanding of learning theory and also that they have experience (hundreds of hours of hands on experience are required to sit for most certification exams). If you have a fearful dog, www.fearfreepets.com will gives you names of trainers who have a certification in fear free training. This training is focused on helping pets feel safer at the vet and being handled by the vet and grooming professionals. Dog training is unregulated industry. Literally anyone can put out a shingle that says they are a dog trainer. Certifications do not a guarantee that the trainer is excellent. They are a great step toward proving competency and dedication to the profession, hundreds of hours of documented experience, and that the trainer has a solid grasp of important topics like learning theory, and in most cases science-based training techniques. Once you have some dog trainer names, contact the dog trainers and see how they respond. Do they answer the phone when you call? Do they respond to your email in a timely manner? Are they willing to talk with you for a few minutes? Yes’ or no’s to these questions don’t mean the trainer is good or bad, but they should give you a feel for whether or not you want to work with him or her. If a scheduling office answers the phone, are you able to talk with the trainer before they come to your house or you go to their class? We find that, at minimum, a quick chat or email exchange is the best way to get started in relationship with a dog trainer. This is a person that you are going to trust with your dog, and that will need to teach you as well. If your personalities do not mesh, or you are uncomfortable with how they talk to you, it can make learning difficult for you. Bottom line: you (and ideally your dog) should feel comfortable with the dog trainer. Don’t just hire the first person to answer the phone, there may be a reason they are the easiest to reach. Not all dog trainers have clients you can call. We generally don’t offer up client names because it would involve a lot of back and forth between the existing client, us, and the new client. We do have lots of Google and Facebook review and success stories on our website. Because our primary referral partners are dog rescues and vets, we rarely get asked for other references. Make sure to ask the dog trainer how much the training will cost. If they won’t quote a price – at least a ball park figure – over the phone, I would move on. At the end of the conversation, ask yourself “Did I enjoy talking with that dog trainer? 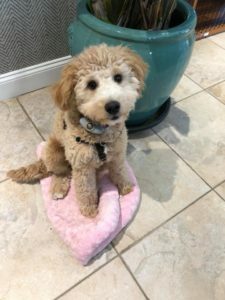 I am OK with all of the answers to my questions – especially about what they do in training and how they get behavior?” If the answer is not a certain “yes!”, keep interviewing other dog trainers. It is imperative that you are comfortable with the dog trainer and the dog trainer’s methods. Group dog training classes are typically help in a facility of some sort. The facility may be a pet supply store, dog daycare or boarding business, vet office, or stand alone training business. Group dog training classes typically meet 4-8 times for a set fee. Fees vary by location, but generally fall into $25-50 average per class meeting. 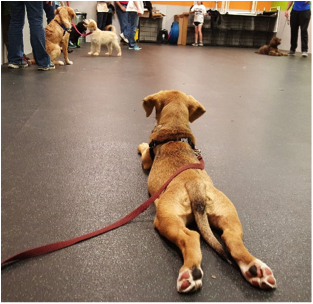 Group dog training classes can be effective for learning basic commands (sit, lay down, come, stay, leash walking). 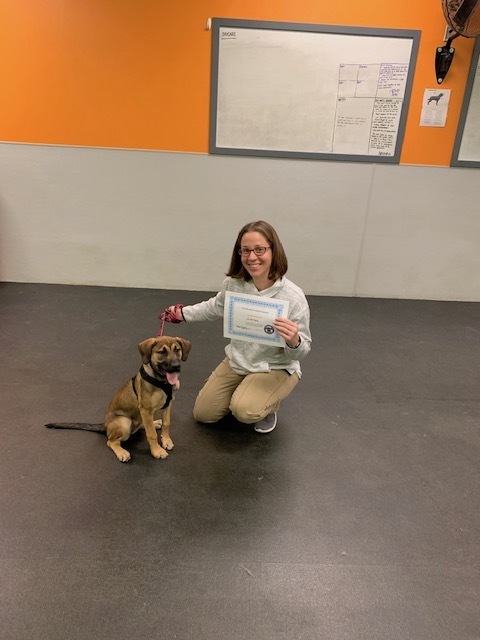 Classes are usually not recommended for dogs with fear issues, severe dog reactivity, or aggression towards people or dogs. They are also less effective for things that only happen in the home. 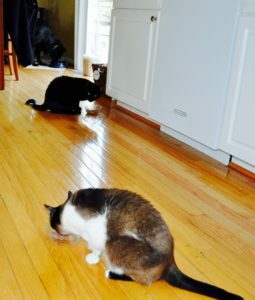 Chasing the pet cat, house training, and separation anxiety are good best handled in private lessons. Private dog training lessons are the way to go for home-specific challenges. Aggression toward dogs or people should be handled in private lessons. They are also very effective for people who need faster results than group classes. They are also great for people have varying schedules or who can’t meet when the group class meets. Day training is where the trainer comes to your home and trains the dog one-on-one. Training happens in the dog’s home with owner not home or not always participating. This type of training can be great for leash walking, basic commands, leash reactivity, and more advanced obedience commands. In our day training programs we do several lessons with the owner involved throughout a 2-4 week program. These lessons are called handover lessons. They help the owner build on the progress the trainer is making with the dog. Owner included lessons are typically held every 4-8 lessons. Board and train is an arrangement where the owner drops the dog off at the trainer’s location. The dog lives at the location for a set duration of training. 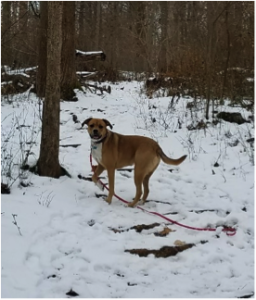 If you decide to go this route, make sure you understand what tools and techniques the trainer will use on your dog. This type of training should also have a handover process for the owner to learn what the dog learned and how to continue the training. The best time to get started on training with a new dog is within the first few weeks the dog is in your home. For puppies, get started within the first few days of getting the puppy. There is no replacement for starting out right with your dog. No time like puppy time to start working on training & socialization! If your dog is starting to show challenging and potentially dangerous behaviors like aggression to people or other dogs, guarding objects, or separation anxiety, contact a trainer right away. These behaviors are unlikely to resolved on their own. Googling or reading about how to resolve these behaviors is not recommend as a replacement for working with a professional. At the end of day, remember this: doing training with your dog is really about investing in you and your relationship with him or her. Learning how to understand your dog’s needs helps you feel more relaxed and comfortable with your dog. Your happiness with your dog is what makes him or her awesome, and you are worth it! Did you know that January is National Train Your Dog Month? The Association of Professional Dog Trainers started National Train Your Month 8 years ago to promote training your family dog to have everyday manners. 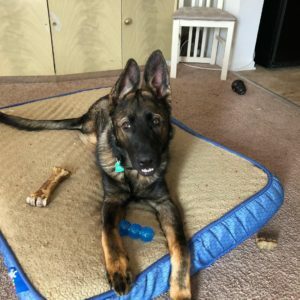 Their website, trainyourdogmonth.com is chock full training tips and videos on everything from new puppy challenges, safe interactions between dogs and kids, what to know when you own a large breed dog, and how to choose a kennel or groomer. New content will be added throughout the month too. Make sure to check out their site. Why should you bother training your dog? Dogs who have had some training are less likely to end up in shelters or being returned to rescues or breeders. 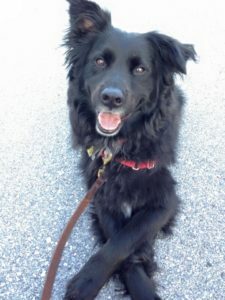 Dogs who get regular mental stimulation through training are happier, more relaxed, and are easier to live with because they aren’t always brimming with unbridled energy. Training can take the edge off of a nervous or anxious dog. Training teaches a dog to look to his owner for guidance. And last but not least, training is fun for dogs and people. What behaviors should you train? Start with the basics. Sit, Lay Down, Come, Stay, and Touch are great commands to begin with. Think of your dog learning these commands as putting tools in your toolbox – behaviors you can call on your dog to do instead of things you don’t want him to do. Have a dog that jumps on people? Teach him a rock solid sit and call on this behavior when she wants to greet people. If she sits, she gets attention, and a dog that is sitting can’t be jumping at the same time! Same thing with a solid down – a dog that is lying down is not jumping on people. 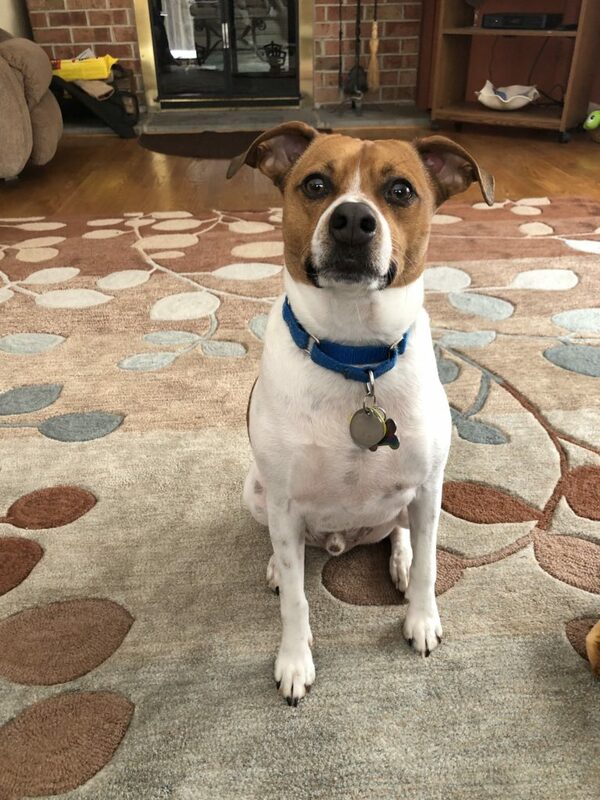 A dog who comes when called can’t be doing a myriad of other things we don’t like – barking at other dogs, getting into the trash, chewing on your shoes – the list is endless! If you are a DYI kind of person, YouTube and Facebook have great training videos and groups. Our recommendation for training is always to use positive training methods. Our favorite YouTube channels for this are Kikopup and Zak George. These two trainers have hundreds of great videos that are easy to follow and get great results. If you prefer to have someone teach you one on one, private dog training lessons are the way to go. When we work with clients we customize our programs to meet our clients goals and dreams for their dogs. We provide written training plans and handouts and lots of other great materials to support you in your training. 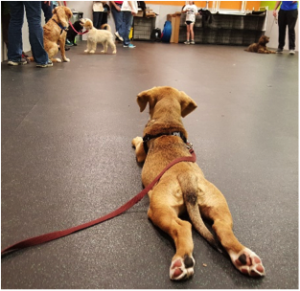 If you prefer to learn in a group setting, group classes can be lots of fun for dogs and people – and we offer those too! Check out our group class schedule on our website https://Pepperspaws.com. Why should you use puzzle toys with your dog? Puzzle toys are great for dogs! Dogs really do enjoy having something to do. Puzzle toys give them a problem to solve. This gives them mental stimulation (think tired brain)! Toys come in all shapes, sizes, and challenge levels. Most puzzle toys reward the dog with food for solving the puzzle. That makes puzzle toys a great way to feed your dog a meal too! Puzzle toys are great for cold or hot days when a long walk isn’t safe. They add some run to a boring rainy day inside. They can also provide lots of challenge for very little owner work too! Toys that are filled with kibble are great for feeding your dog her meal. All you do is put the kibble inside and let the dog go to work! Some of our favorites are the Kong Wobbler, Treat ball food puzzle, stop bloat food puzzle, slow feeder, and the original Kong. Outward Hound has several more challenging and elaborate food puzzle toys. The Dog Brick Treat Puzzle has compartments that lift and slide, adding more challenges for the dog. The Dog Twister Dog Puzzle Toy Dog Game is even more challenging for dogs. If you have a hound or dog who loves to use his nose, check out the Wooly Snuffle Mat. This is a great way to your scent-driven dog to work for his food! Some dogs need help using food puzzles – especially more challenging ones. If your dog seems stuck or frustrated by the puzzle, help him. You can give him a sneak peak at the reward, help some food to fall out, or just encourage him to not give up! If you make a puzzle too difficult (freezing the Kong, for example), work with him to get to the reward. Simple, low tech activities can provide enrichment for your dog too. Load up a muffin tin with your dog’s dinner, then put tennis balls over each muffin hole. Then let your dog figure out how to get to his food! Scatter your dog’s food in your yard or a room in your house. Then tell your dog to “find it!” and let her search around for her food. Just like with your dogs other toys, rotate the puzzle toys! Switch up which ones he gets and how often he gets them. If he seems to lose interest in a puzzle toy, put it away for a week or two. The next time your bring it back out he just may love it the most – just because it is new again to him! You also freeze the food in Kong toys. Or you can change up the food reward in the Kong. Things like new treats, baby carrots, blueberries, squeeze cheese, and other yummy food are great to entice dogs to dig into the puzzle toy. The Kong Company website has lots of great info on this! As with all food training and enrichment for dogs, if your dog growls, snaps or bites when you go near him when he is eating or his food do not do these activities with him. Immediately consult a positive reinforcement trainer. Children should be supervised at all times around dogs. Starting out Right with Your New Puppy! 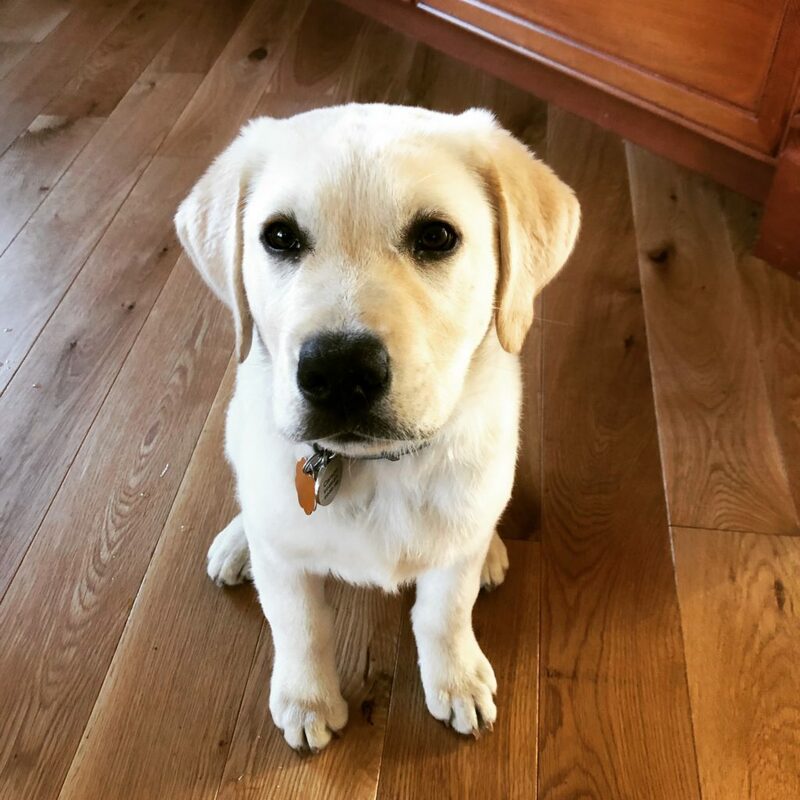 Puppy Training: To kick off 2018, we will be doing a series of posts about how to get started with a new puppy. This is the first post in the series. Is Santa brining your family a new puppy for Christmas? Maybe the new puppy has already arrived? 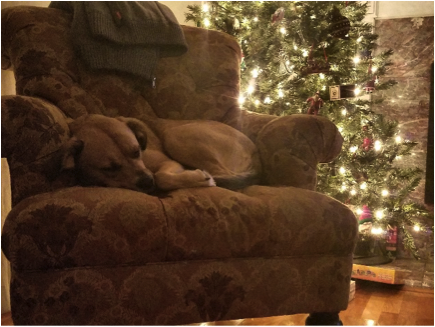 The December holiday time is a very common time for adding a new dog or puppy to your home. While December can be a great time for the new addition because people have time off from work or school, it is also a time wrought with it’s own stresses, let alone the stress of caring for a new pet. 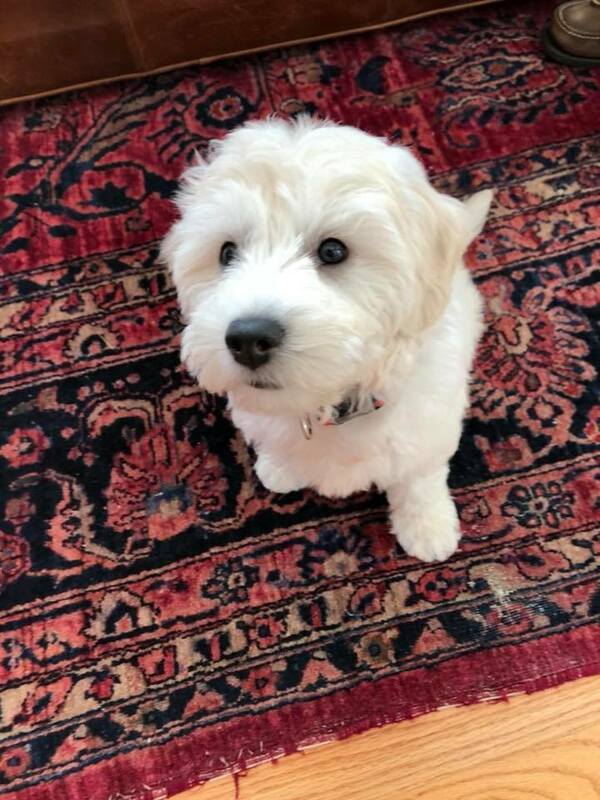 We have some puppy training suggestions and ideas to help you help your new dog or puppy settle in with you, adjust to your new home, and make sure you both get off on the right foot. First up, invest in a sturdy crate. Your crate should be where your puppy sleeps during the night, naps during the day, and hangs out when you can’t actively supervise him. Active supervision means you are watching the pup – 100% of the time. If you can’t actively supervise him because you are making dinner, doing laundry, helping with homework, or anything else – that’s where the crate comes in. Your puppy’s crate should be big enough for him to stretch out in, stand up and turn around in, and sit up tall in. It should not be so big that he can poop or pee in one end and still sleep comfortably in the other. You may think a large crate is “nicer” for your puppy. However, for a puppy learning where to go potty, a large crate is confusing and leaves too much room – literally – for mistakes to happen. Your pup may need help to learn how to love his crate. He may be used to beign surrounded by his littermates, so being alone can be scary at first. 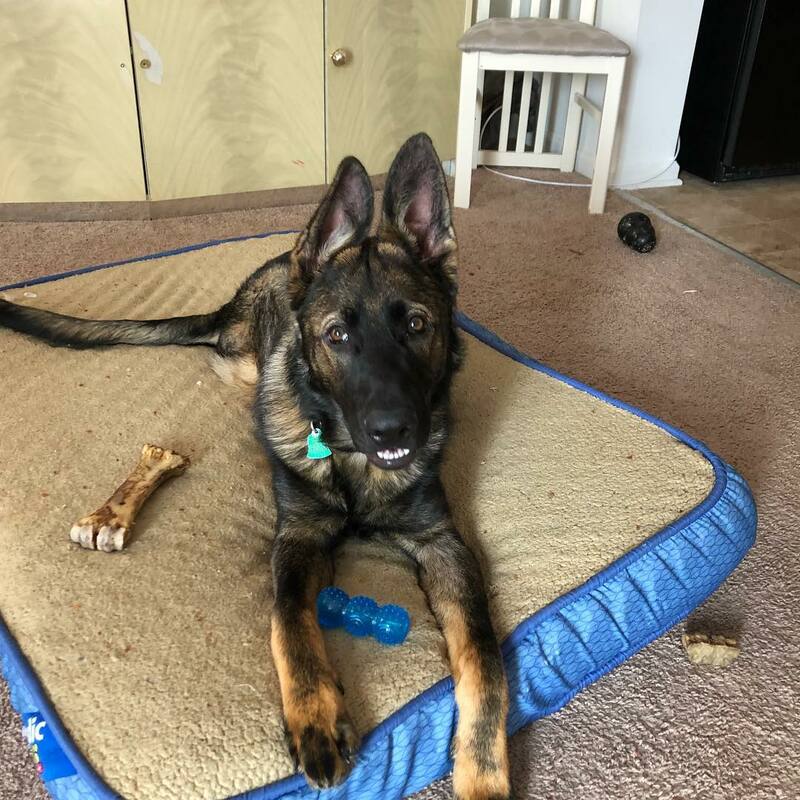 To help your pup be comfortable in his crate, first make sure he is getting lots of exercise – play time with toys, play time with you, chasing balls, and learning new commands with you are all great ways to ensure your pup is good and tired when it is time for some down time in his crate. Some pups will walk in their crate and lay down without a fuss, some need some encouragement, some need to learn crates are awesome. Playing crate games can be a great way to show your pup that crates are fun. To play, get a handful of your pup’s food and toss 1 piece in at a time. Let your pup go into the crate to eat the food and when he comes back out, toss another piece in. You should soon see that your pup decides to hang out in the crate and wait for the next piece of food – this is what we want to happen! Toss in a few more pieces and then lure your pup out of the crate and start the process over again. After a few rounds of this, toss a small handful of food in the crate and close the door before your pup can go back in. Then, when he looks eager to go in, open the door and say “crate up!” in a happy, excited voice. This is the beginning of teaching your pup to go in his crate on command. Look for more crating tips and tricks in our next post in a few days. 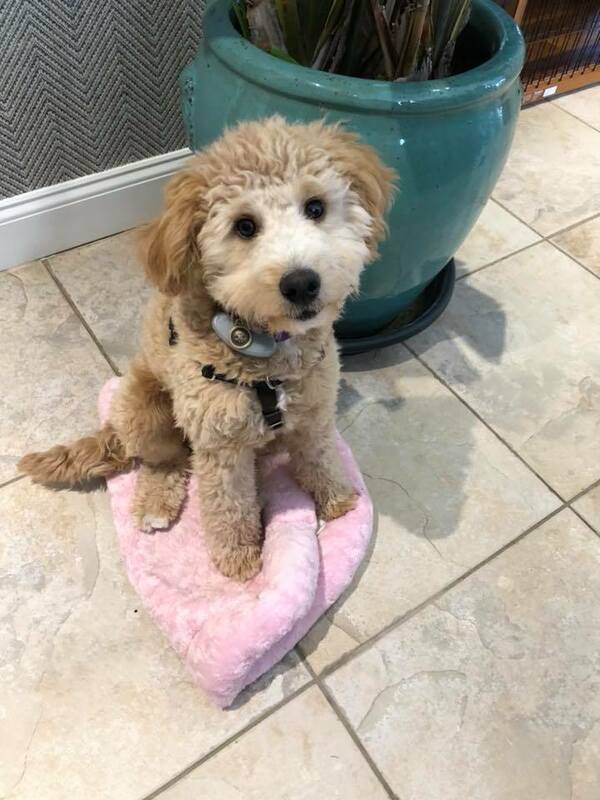 Interested in puppy training classes? 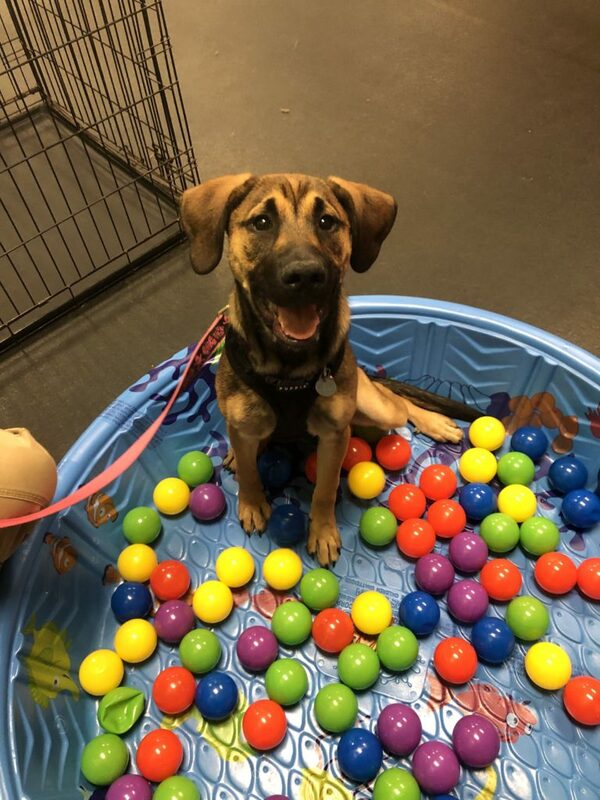 Click here to sign up for our next puppy class! 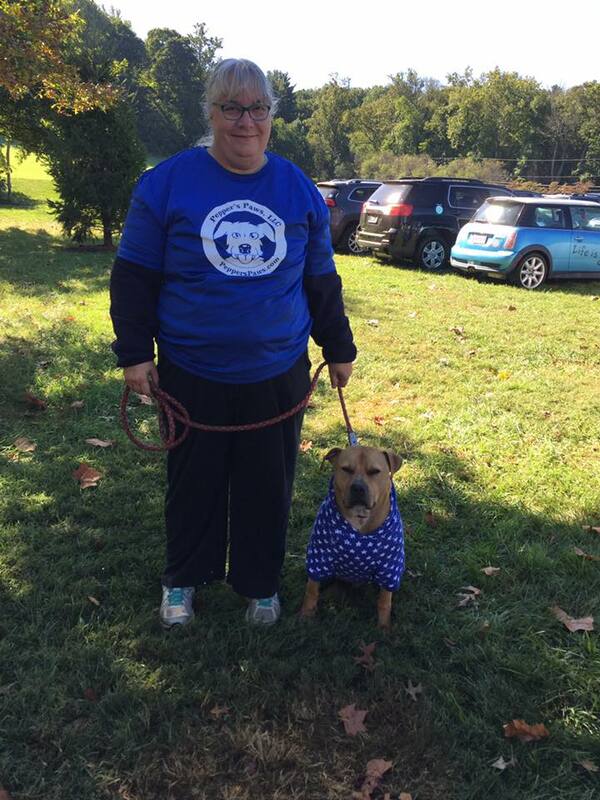 Join Team Pepper’s Paws for the American Cancer Society’s Bark for Life event Oct 22! 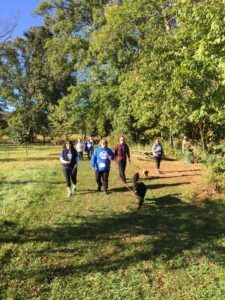 The Pepper’s Paws dog trainers and their families will be taking part in this year’s American Cancer Society’s Bark for Life 5K Run/walk and 1 Mile Fun Walk and we’d love for you and your dog to sign up to walk as part of our team and walk or run with us! We are passionate supporters of owner’s walking their dogs with other dogs. In fact, we feel so passionately about this, we are one of the event’s top sponsors! 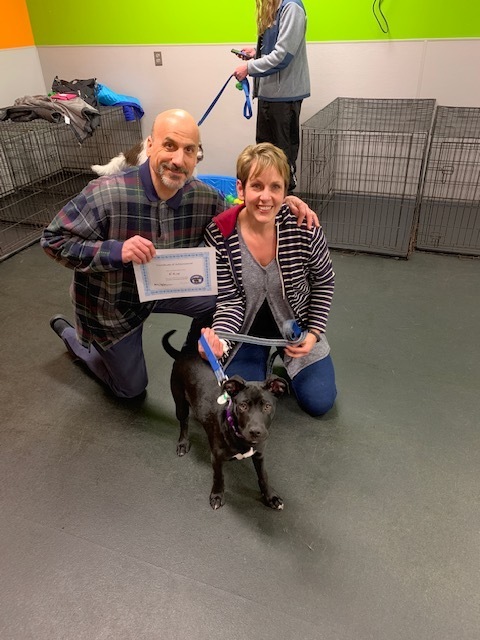 Pepper’s Paws trainers have hosted group walks for our clients and we have seen amazing changes – in both dogs and their owners! 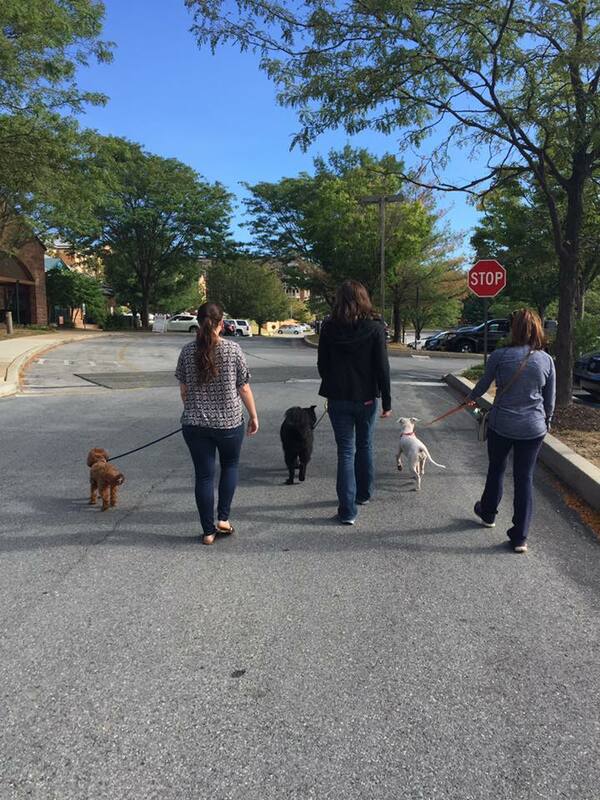 Walking your dog with other dogs can help your dog to be calmer around other dogs, and, since every dog has a person at the end of the leash, group walks can also help your dog be more relaxed around strangers. Dogs who get daily walks – with or without other dogs – are more likely to have their physical and mental exercise needs met, which leads to calmer behavior in the home, less destructive behaviors, and, in some dogs, less anxiety as well. Interested in joining one of weekday group walks? Would a weekend walk work better for you? Let us know! The event will have food trucks, vendor tables, and lots of great raffle baskets! Lots of great vendors will be there too – make sure to them for info and free giveaways! There will be fun things for kids to do! The event is held in East Goshen Township Park! It is a great opportunity to get to know our trainers and pick our brains! You and your dog may make friends to do your own group walks with! You will love it too! Seriously, there’s just something fun about walking your dog with other dogs! Please join us for this fun event to support a great dog rescue – they need our help to save dogs. Click here to sign up and join Team Pepper’s Paws! A limited number of Team Pepper’s Paws will be available for team members to purchase. Email us if you would like a shirt. 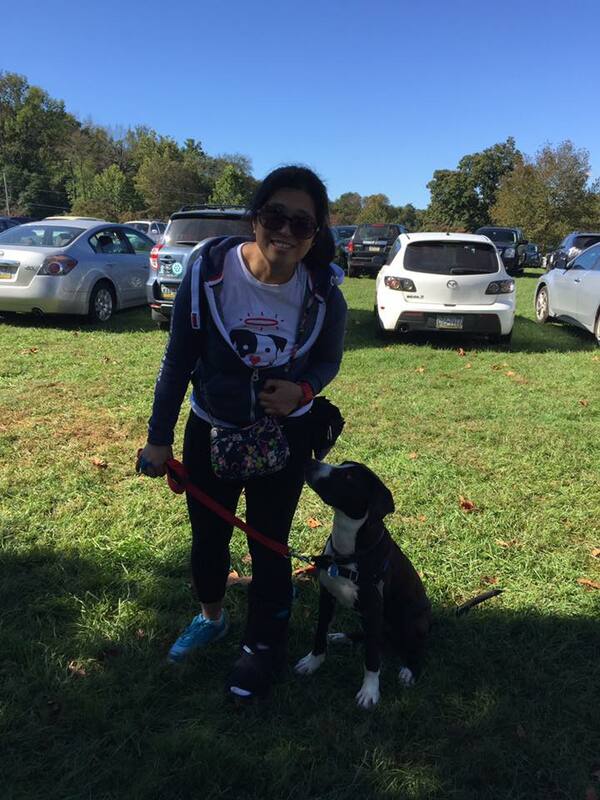 Join Team Pepper’s Paws for TLC Rescue’s Miles for Mutts! 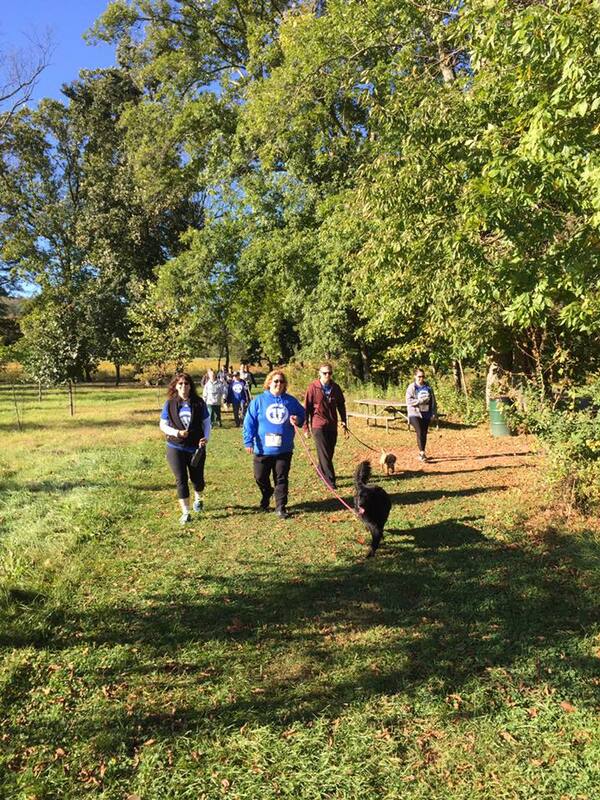 The Pepper’s Paws dog trainers and their families will be taking part in this year’s To Love a Canine Rescue (TLC) Miles for Mutts 5K Race and 1 Mile Fun Walk and we’d love for you and your dog to sign up to walk as part of our team and walk or run with us! 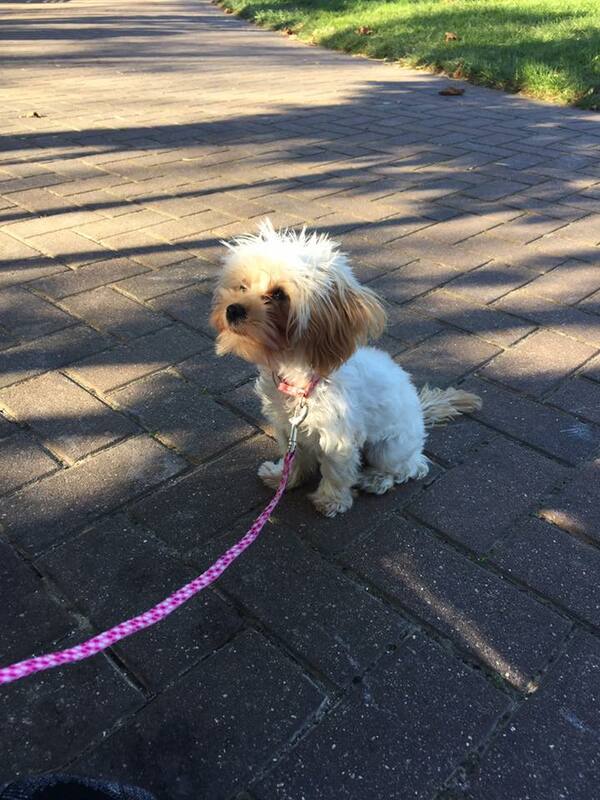 We are passionate supporters of owner’s walking their dogs with other dogs. In fact, we feel so passionately about this, we are one of the event’s top sponsors! Top 10 Reasons to join Team Pepper’s Paws for TLC Rescue’s Miles for Mutts 5K Run/1 Mile Walk:The event will have food trucks for post-run/walk refueling! The event will have food trucks for post-run/walk refueling! Lots of great vendors will be there too – make sure to stop by Pepper’s Paws tent for free giveaways! There will be arts and crafts and other fun things for kids to do! You get a TLC T-shirt just for walking or running! The event is held in beautiful Warwick Park! All proceeds of the event help TLC Rescue save more dogs. The money raised will cover vet bills, supplies, and rescue costs associated with saving dogs in high risk shelters! Please join us for this fun event to support a great dog rescue – they need our help to save dogs. Click here to sign up and join Team Pepper’s Paws. Anyone with a well-behaved dog is welcome to join us!